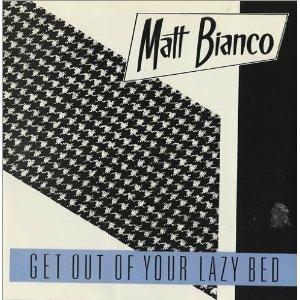 "GET OUT OF YOUR LAZY BED"
The video clip features Matt Bianco performing one of their best-known songs on Top Of The Pops in 1984. This is one of those tunes that I used to sing to myself at work, much to the amusement of my colleagues! I'm actually surprised to learn that such a catchy song (that had a lot of airplay on Radio 1) didn't even break into the top ten here in the UK. The British sophisti-pop band formed in 1983 and had four Top 40 hits in their home country. Get Out of Your Lazy Bed was the band's debut single and reached #15 in the UK. It was taken from the debut album Whose Side are You On? which contained the first five UK singles chart hits. Released in 1984, the album peaked at #35 in the UK album charts. Although Matt Bianco weren't highly successful with many of their single releases, they did release two more albums during the eighties, which were moderately successful. The self-titled Matt Bianco reached #26 UK album charts, and Indigo faired even better, reaching #23. "Get Out Of Your Lazy Bed" was used as the theme music on the children's Saturday morning breakfast TV show "What Now" during the 1980s and 90s in New Zealand. Launched in 1981, the show is still being broadcast.